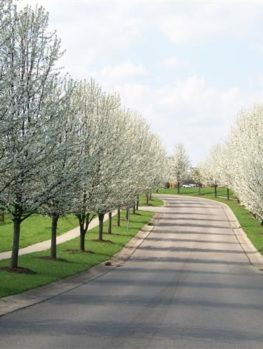 There are many lovely flowering trees, but a lot of them won’t grow in tough urban conditions and poor soil. That is certainly untrue for the Cleveland Flowering Pear Tree, which will grow almost anywhere. Specially bred for difficult sites, not only will this tree thrive in almost any soil, even clay and the poor soil of city gardens, it can fit into a small space too, growing tall, but staying narrow and neat. As if that was not enough, it will be smothered each spring in brilliant white flowers and the leaves turn spectacular shades in fall. 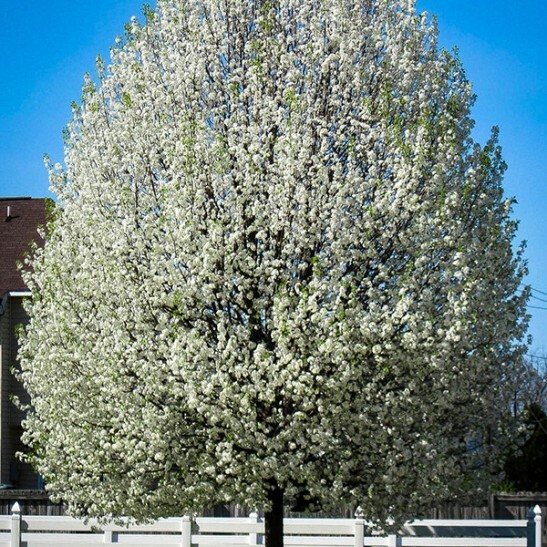 Because of its upright habit and narrow form the Cleveland Flowering Pear Tree is an ideal choice for smaller gardens and narrow spaces. It is hardy, disease-resistant and grows in almost any kind of soil. It is also drought-resistant and needs very little care or attention to be constantly beautiful. 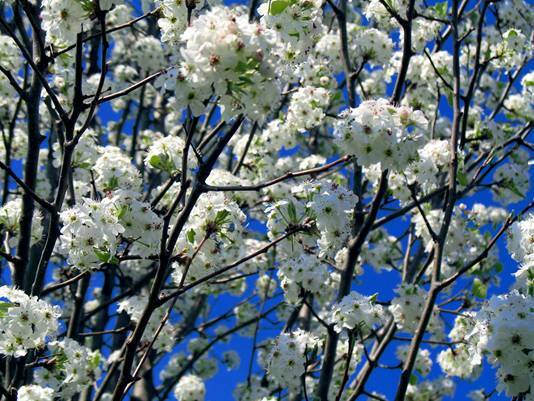 *Cleveland Pear should not be planted in Missouri, where it has been declared invasive. Flowering trees really lighten-up the garden and early spring flowers are especially welcome after the long, dark winter. So a tree that flowers in April, needs no care, is healthy and also fits into a small garden is a real treasure. 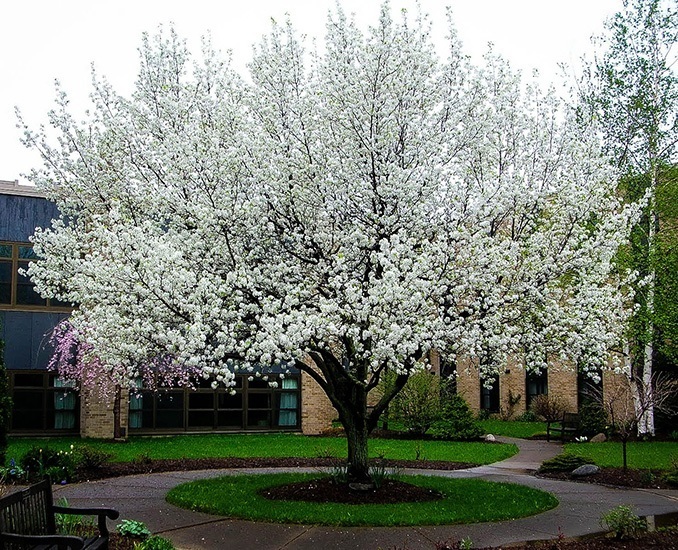 The Cleveland Pear is that tree; it grows throughout all the milder and cooler parts of America and blooms profusely every spring. In addition to all of that, it has a narrow, tear-drop shape that naturally looks freshly trimmed and is always neat and attractive at any age, from young tree to mature specimen. A row planted as a screen is a lovely sight and is especially useful when space is limited but screening is needed. Cleveland Pear is a fast grower, averaging 4 feet a year when young and quickly reaching 35 or even 40 feet in about 10 years. Once established it is drought tolerant and although it prefers a loamy soil it will grow well on clay soils too, meaning it is highly adaptable to most kinds of soil. It is also very resistant to urban conditions, so it is a great choice for town and suburban lots. It is not especially resistant to deer and may need some protection when young. It is, however, not affected by insects and is resistant to that scourge of Pear trees, fire-blight. Indeed this tree was specifically introduced to test for resistance to that disease, which has been responsible for the loss of millions of pears. Selected forms, including the Cleveland Pear, proved to be very disease resistant. 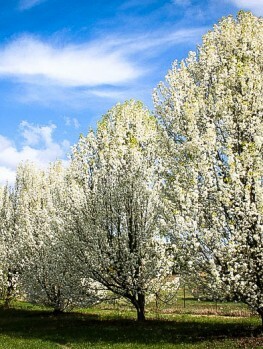 The Cleveland Pear is an upright tree growing 35 to 40 feet tall and 12 to 15 feet wide. It has an attractive, symmetrical tear-drop shape and is ideal for narrow spots or small gardens. The trunk is straight with smooth bark that is light-brown to reddish-brown in color with prominent horizontal beige markings, making it attractive in winter. The flowers are white and born in profuse clusters in April. The leaves are smooth, glossy, oval in shape and almost three inches long. The flowers are white and produced in clusters all over the tree, while the branches are bare or just beginning to show a few tiny leaves. It is a beautiful sight in spring. The leaves last late into the fall and unlike some trees do not need particularly cold temperatures to color well, so this is a good choice for fall color in more southern regions. Fall color is especially brilliant in this variety, being red to purple and very reliable. The branches are upright, but not as narrow as in the older Bradford variety, which was prone to winter breakage. 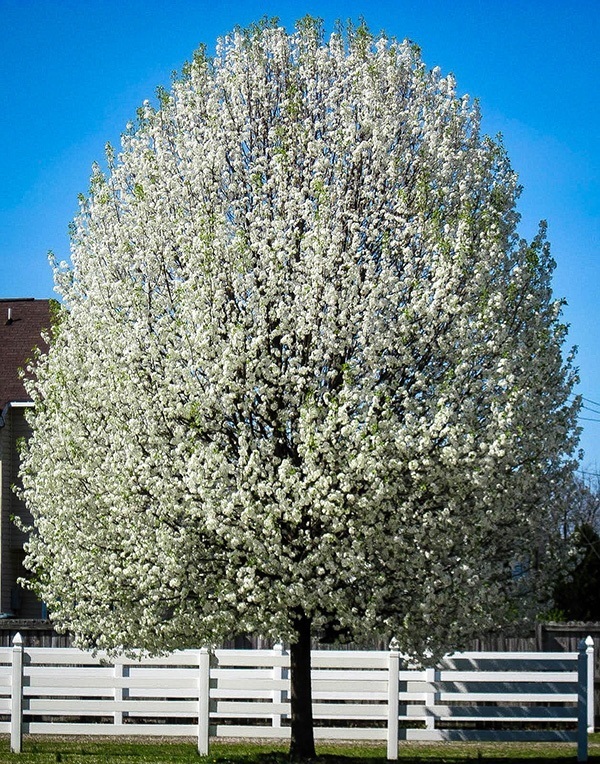 The Cleveland Pear is much less likely to break during winter, so it is a good choice in areas with heavy snow falls. 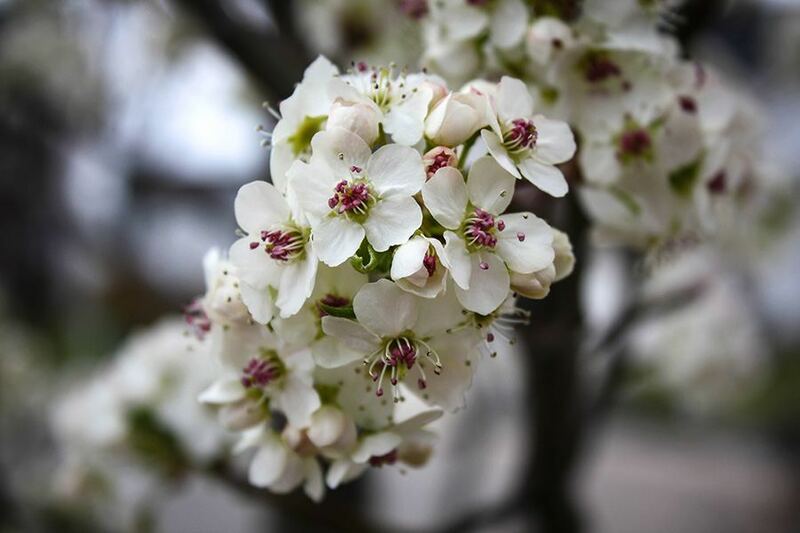 The Cleveland Pear is hardy from zones 5 to 9, so it will grow in all but the coldest mid-western states. It grows well in almost all kinds of soil and is particularly useful on clay soil where other trees may not grow so well. Once established it is drought resistant and coupled with its disease resistant and naturally neat form all this makes for a tree that can be planted and enjoyed without a lot of work. Because the Cleveland Pear is more upright than many other trees, they should be planted 5 feet apart when planting a row for screening. Because of the narrow shape it can be planted within 7 or 8 feet of a building. Dig a hole or a trench two or three times wider than the pot, but no deeper. Place your plants in the hole, replace most of the soil and firm it well down. Then water thoroughly and when the water has drained away put back the rest of the soil. The Cleveland Pear does best in a sunny position, but can be planted in shade if it can reach the sun as it grows taller. It is rarely necessary to prune this tree, but if you do need to, do this during hot, dry times in summer, to avoid disease. Fertilizer or special care is rarely necessary but when young it may need some extra water during very dry spells. 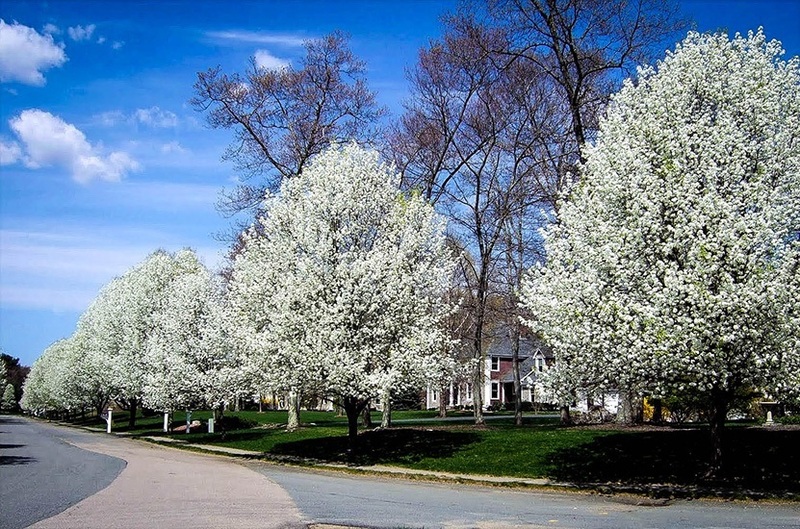 The Cleveland Pear is a selected form of the Callery Pear (Pyrus calleryana), which is a native to parts of China. It was first brought to America in the early 20th century by that prodigious plant collector Frank Meyer, who was an official ‘agricultural plant explorer’, for the US Department of Agriculture. Although introduced for agriculture, it was eventually grown simply for its beauty and hardiness – certainly not for its fruit, which is small, hard and rarely even produced on cultivated trees. This means, of course, that messy dropping fruit is not an issue with the Cleveland Pear. This tree replaces the Bradford Pear, which was an earlier introduction that proved prone to breakage. It is also sometimes called ‘Chanticleer’ or ‘Glen’s Form’, but all these names refer to the same plant. The Cleveland Pear is a particular, selected form and only the exact plant will have the rightcolor and growth rate. So it must be produced directly from trees known to be exactly the right variety. Our trees are grown the correct way, from grafts of these special trees onto hardy rootstocks. That way every tree is identical to the original so you get the right features and they produce a very uniform effect when planted in a row. However these take longer to produce, so avoid cheaper, seedling trees that will only be a disappointment.